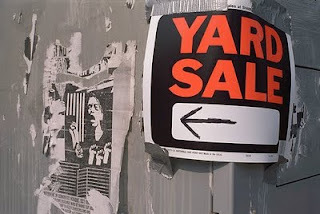 The Thrift World: How to yard sale with the best of 'em! Look in your local merchandiser, check craigslist.com, the best deals out there can be found in people's backyards across the country every Saturday morning! It may seem like an odd concept to travel to other people's homes and dig through boxes of stuff they are getting rid of. In reality, people give away junk as well as treasures for pennies on the dollar each week. It's your job to find the treasures, and trust me, they can be found. 2 - Go to well-to-do neighborhoods. They've got money so they've got the best stuff. 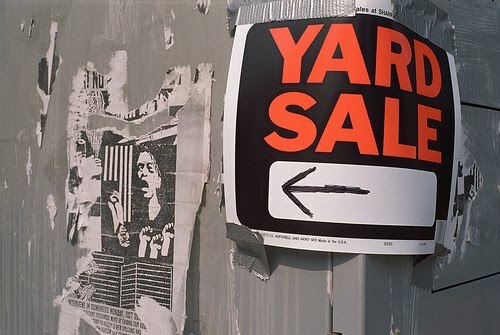 3 - Find community yard sales. I am not a big fan of driving around to independent yard sales even though my mom swears that's where you find the real treasures. I love community yard sales because you just park your car and walk around the whole neighborhood, saving on gas and time spent searching for people's homes. Figure out which strategy works best for you and just go with it. 4 - No price is permanent. If you'd pay less for something, offer it out. Most people just want to get rid of their stuff and will probably take you up on it or counter offer. 5 - Consider upcoming gift-giving. I buy lots of brand-new or new-looking gift items at yard sales for future birthdays, baby showers, weddings, etc. Sometimes I don't even know who I'm going to give it to, but I buy something anyway knowing eventually it will make the perfect gift for someone. I've bought journals, candles, baby growth charts, picture frames and lots of other goodies that I've given as gifts that looked brand new (some stuff was). Remember, gifts don't have to be expensive to be meaningful and exactly what someone wanted. I have gotten SO MUCH great stuff at yard sales! In fact, I've got too much stuff, so my friends and I will be hosting our own this Saturday and hopefully I'll be able to sell some of my CDs, housewares, decor and other stuff I don't need anymore. If there's anything I love more than thrifting, it's getting rid of stuff! More on this next time!